St. Patrick’s Day is the time of year when we celebrate Irish culture, but everyone is welcome to join in on the fun. And Oklahoma sure knows how to throw a party. Get your green on and come out to one of these great locations for Irish food, whiskey and beer. Here are 12 great places to celebrate. Oklahoma City St. Patrick's Day Parade kicks off at 10 a.m. When it ends, come on down to Bricktown for a Block Party on the corner of Sheridan and Oklahoma. Local musicians and performers will provide entertainment while you and your friends scarf down mugs of green beer. On St. Patrick’s Day, the Myriad Botanical Gardens get festive with Celtic music and celebration. Wear green, look for a leprechaun in the garden and have some great activities while enjoying Irish food. 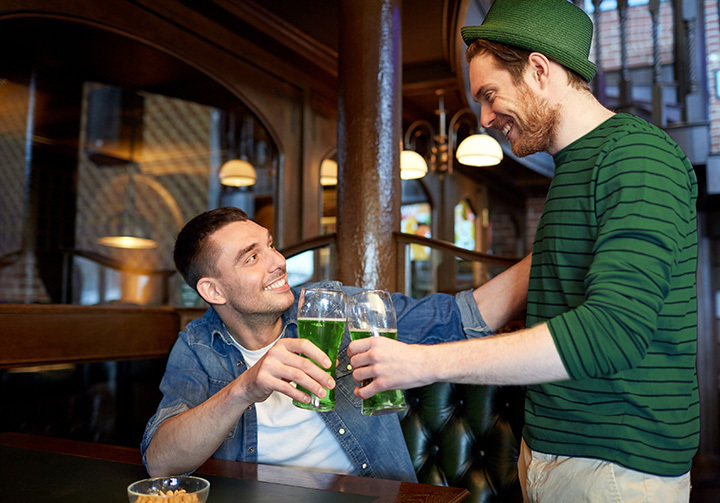 Hang out in a fun pub where they’re sure to have an Irish party on St. Patrick’s Day, complete with green beer. Arnie's Bar is known for their St. Patrick's Day celebration. There will be plenty of places in the Blue Dome District to get green beer, but Arnie's is an Irish landmark. Kilkenny’s is another great place to get traditional Irish food in Tulsa. The Sevensisters Steak and Guinness Pie and King’s River Fish and Chips are two of the best meals you’ll find in the Tulsa area. The city of Enid always hosts a St. Patrick’s Day parade, but the place to get your green beer is Callahan’s. Although the pub features some Far East inspirations, you’ll find traditional shepherd’s pie and Scotch eggs on the menu. Downtown Claremore hosts a block party on the Main Street Tavern Parking Lot. Downtown stores remain open for shopping. Corn beef and cabbage will be available for sale and there'll be plenty of Celtic entertainment. If you can’t get to Ireland, take a road trip to this ghost town that once was a rowdy oil town with saloons, gambling halls and brothels as part of your St. Patrick’s Day celebration. Maybe you will find a leprechaun. Saints lists itself as a “new kind of Irish Pub.” It’s located in the Historic Plaza District and serves traditional Irish flair with an American twist. This celebration will feature plenty of Irish beers, and it’s the biggest day of the year at Saints. This event calls itself “a wee tiny festival in the heart of the ‘Ville.” Run the 5K, dress up and enjoy yourself all while benefiting a local non-profit. With three locations, you are sure to find a table on St. Patrick's Day to get your green on. McNellie's site boasts that they feature an impressive collection of Irish and Scottish whiskey. Definitely worth checking out this St. Paddy's Day. The Fur Shop celebrates St. Patrick’s Day with great beer and Celtic music for an authentic Irish experience. The Guinness and the Irish Whiskey will be flowing.